In my book, the world’s most perfect food is the dumpling. I love dinner items that are an all-in-one meal. Like dumplings… vegetables, carbs, all of it in one perfect, neat little package. What more could you ask for? My dad makes these delicious fresh-from-scratch dumplings filled with shrimp, white fish, scallion and ginger. He wraps them with store bought wrappers and gets the thick skin that give the dumplings a little more texture. He knows I love them so when I come home to Cupertino, he packs me two huge Marina Food grocery bags of 100 beautiful little frozen dumplings and sends me on my way. But, what to do with all of these dumplings? Tonight I cooked the dumplings two different ways for me and my lovely bf. It only takes 10 minutes if you already have the frozen dumplings, which if you don’t have a homemade cook to make them for you, you can get some from any asian grocery store, chinatown, japantown, or my favorite, Trader Ming’s (Trader Joe’s, very cleverly titled, asian food line). Boil a medium pot of water and carefully drop the frozen dumplings in. Meanwhile, cut up some baby bok choy (also called shanghai bok choy) and split each heart into quarters. Include the bok choy into the dumpling water and cook for 3-5 mins. Don’t overcook, otherwise it will be rubbery and tough to chew! Take out of the boiling water and set aside. In your serving bowl, add a few pinches of japanese fish seasoning, I forgot what it is called but I’m sure Kayoko knows. It is made out of fish and is delicious in seasoning. Also add a few tablespoons of soy sauce, a tablespoon or so of sugar and spoon some of the hot boiling water that is cooking the dumplings. The hot water will help disolve the japanese fish pellet seasoning and the sugar. Optional step: Add very finely minced raw garlic to the bottom of the bowl. Again, the hot water will cook partially cook the garlic. In a separate pan, beat an egg and fry it up with a little bit of oil. Make sure it is a flat sheet and cut it up in the pan with the spatula. Set aside. 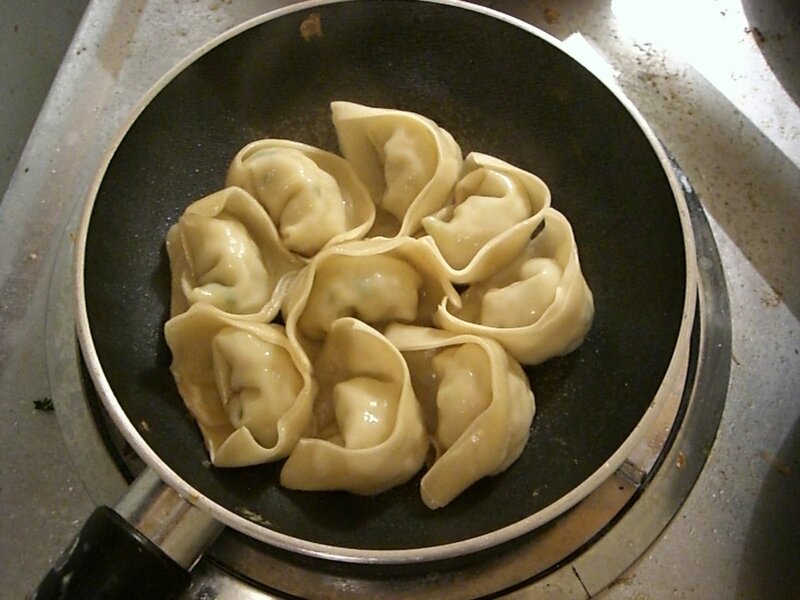 After the dumplings are done, spoon the dumpligs and pasta water into the bowl to the top. Add the baby bok choy, the chopped up egg, and if desired, tear up some seasoned sushi nori and green onions and add to the top. Finish the soup off with a tiny drop of sesame oil. A little goes a long way, if you add too much it will overpower the soup. Heat some oil in a pan. When the oil is hot, add the frozen pot stickers and let the bottoms brown for 5 minutes. Add 1-2 tablespoons of water mixed with a generous pinch of flour. This will help to create the “crust” on the bottom of the pan. Throw the water into the pan and put a lid on. You will hear it sizzle. Wait for 5-8 minutes. Don’t check on it too early! Prepare the dipping sauce. Soy sauce, sugar, vinegar (I like rice wine vinegar), sesame oil, green onions. Take the pot stickers out and plate. I heart dumplings and I hope you will too! This entry was posted on April 26, 2007 at 4:16 am and is filed under *Jenny, Chinese, dumplings, Trader Joe's, Veggies. You can follow any responses to this entry through the RSS 2.0 feed. You can leave a response, or trackback from your own site. “japanese fish seasoning” = “dashi”. thx for this post- i will def. try this!